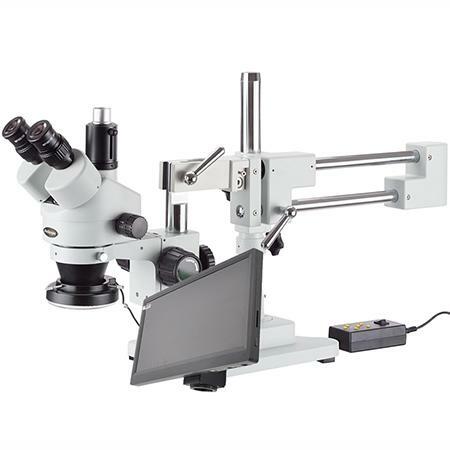 Microscope HD camera with LCD screen has 1080p HD image processing camera that has all in one camera HDMI + USB + SD Card. The camera is combined a 10" HD monitor. Direct output to HDMI Screen for viewing live images. USB Camera, USB Mouse or SD Card. 1/2.8" (5.5x3.4mm) CMOS Sony IMX236(C) sensor. 60 frames per second at 1920 x 1080. Image capture (2mp) to SD Card (included). Camera control panel for exposure, gain, white balance, color, sharpness and noise control. Includes on-screen monitor toolbar for measuring, mirror, comparison, zoom, freeze, cross & browser when using mouse control. C-mount connection to your microscope. USB capture control for Windows, Mac (capture still or movie images). Use included software for making measurements. 10" LCD HDMI monitor, true 1080P. LED backlight. Monitor mounts directly to HD camera. Includes 110~240V power cord and short HDMI cable. Operating System: Windows XP, Vista, 7, 8, 10 (32 & 64 bit). Size & Weight: 3.07" x 2.76" x 3.62", 1lb.